Is anyone familiar with the (relatively) new Tosca on DVD with Gheorghiu/Kaufman/Terfel with conducting from Pappano? It has gotten good reveiws, but wanted to see if anyone here had seen it. I saw this broadcast. I just could not take Gheorghiu at all seriously. She has become a parody of a diva and her acting is plastered on self consciously from the outside. The naturalness that was evident in the Solti Traviata at the start of her stardom has been replaced be a stilted, self regarding style. I decided not to buy it despite everything else being first rate. I subscribe to the Met Opera on Demand as well as Medici.tv - of course the Met has many filmed opera performances, many in HD video, historical as well as recent, and is a huge resource of operas. Medici.tv has over 80 operas from other companies, mostly European, including three of my current favorites which are Robert Wilson productions. So far, I've watched, Pelleas et Melisande, Madame Butterfly, and Monteverdi's L'Orfeo. Generally the singers and orchestras sound good - but the real treat are the stripped down but fascinating stagings. I find them very effective, but they require singers who can act as well as pull off the stylized movement, not to mention singing the roles. Some people find them too stark and contrived but I love them. I plan on purchasing Aida, since it is not available from any streaming service I've found, and as many of the others that I can find. 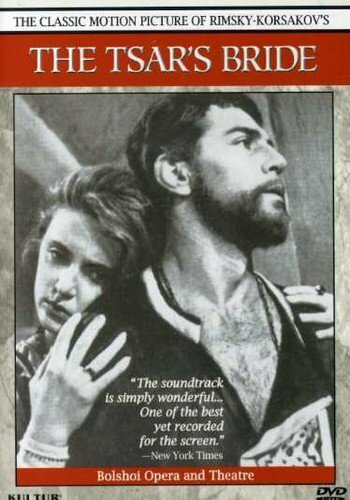 Unfortunately on DVD, apart from what you already mentioned, there is only Wilson's Gluck - Orphee and Alceste. There is complete complete staged Bach St John's Passion on youtube. 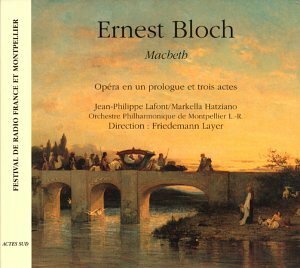 Also on youtube are clips from Ring cycle, Norma, Die Dreigroschenoper, Le Martyre de Saint Sébastien, possibly more, none of which seem to be recorded. Met archives might have Lohengrin he did there some years ago, also Einstein possibly? Neither of those was ever telecast, or taped. A 2014 Théâtre du Châtelet performance of Einstein was available online for a while, but not anymore. Perhaps it'll turn up on DVD one day. Actually, I see there is a pirated version available. I have about 3 dozen DVD/blue rays of operas, I watch more on Mezzo and I also has a subscription on Medici TV. I found these to be poor substitutes to the real thing so I travel and attend to ~ 8 operas live a year. The spatialization of sound the dynamics on intensities, the 3D staging, cannot be found in a blue ray nor in cinema retransmissions of the MET performances. From my collection this is the one I would pick as the best, mostly because of Danielle de Niese magnificent performance as Cleopatra. I have also seen her in les indes galantes were she is also marvelous. Spineur, That performance is one of my own favourites, along with Theodora from the same company. Here is a link to a much earlier discussion. Thanks ! Great review !! I find GMG intimidating at times. When you see the discussion on Beethoven piano sonatas has something like 200 pages !! That's one week of hard work to read all this !! No need to sweat it; just dip in and out of long threads and you will quickly get to grips with increasing elements. No one expects someone to make sure they don't repeat a point or question that was brought up six months and 50 pages ago.....enjoy. Honorable mention for the reissue of Martinu Greek passion, and Anthony Minghella MET production of Madame Butterfly. The Wozzeck broadcasted by Arte was also quite good, if you like Berg operas. and Alexandre Tansman "Le Serment" a real flop. This was a hires (with great sound) live broadcast from the Marinsky theater (not the Kirov), so it is newer. If I juge from the cover, the staging and the costume look also different. I saw it "Live in HD" in movie theatres. I found the machine less distracting than inadequate to portraying the various settings. It does have its moments, but the hours... Aside from the physical production, there's nothing much revelatory, or outrageous about the directing. It's a fairly conventional production, with a gimmicky set. Voigt, a singer I admired earlier in her career, is also inadequate. It's not surprising that after this Ring, her only Met appearances were in a five Wozzecks the following season, and she seems to have retired, if not officially, then for all practical purposes. There are just a lot of better Rings out there. Thank you Wendell-E for your quick response. It is a real shame that you found the machine inadequate in portraying the various settings as so much money and hype went into its making. I should mention that I am a HUGE fan of the first MET Levine ring cycle (1989-1990) as I love traditional productions. 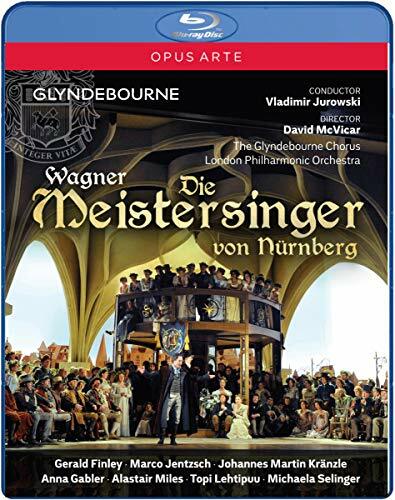 I thought this new release would be a huge step forward in realising Wagner's very elaborate vision (technology saving the day sort of thing). Then I started looking at clips on youtube. Initially my eyes didn't take too well to this new technology. How do I explain this........ I could always see the "planks" irrespective of what was projected on them. I thought this will always look inferior to a set built on stage as in the first Levine ring cycle. Your comment regarding the inadequacy in portraying the various setting confirms what I feared. 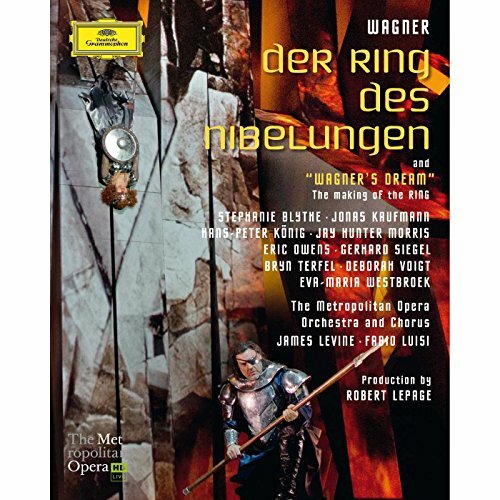 I should mention that I am a HUGE fan of the first MET Levine ring cycle (1989-1990) as I love traditional productions. Yes, I've got that one as well, and certainly prefer it to the new one. This.....is nothing short of SPECTACULAR!!!!!!! Strange how we all see things differently. 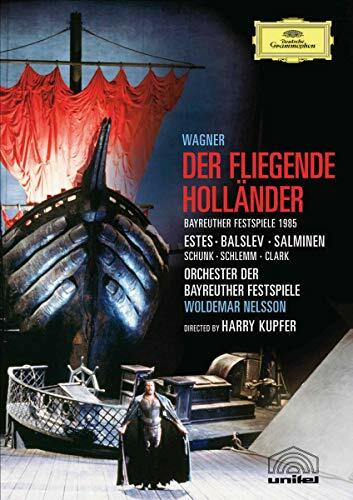 I think Harry Kupfer's Dutchman staging is superb, remains essentially close to the letter of the libretto while shedding some great psycholgical insight on the work, and has moments of spectacular beauty. 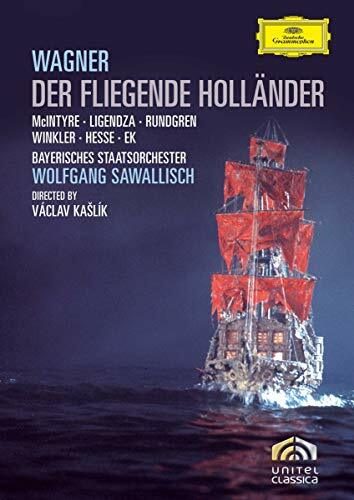 I saw it live in the Festpsielhaus in 1979 and was bowled over, and revisited it on DVD many years later and enjoyed it just as much. 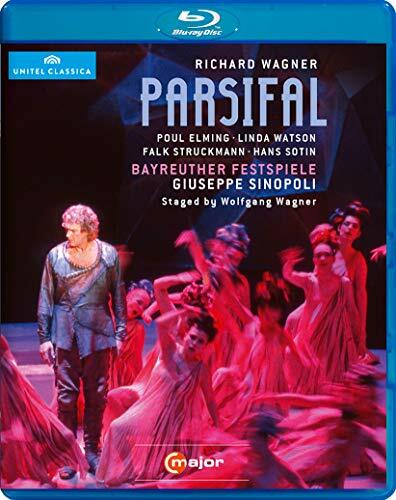 I think its status as a classic of Wagner staging is well deserved. 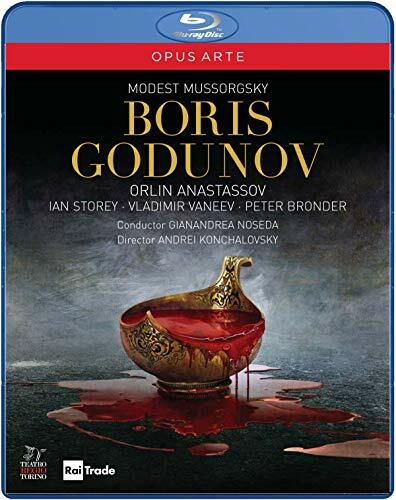 And I'm not really that much of a fan of Kupfer (his Bayreuth Ring, and Berlin Salomé and Tristan--I saw the latter two live as well--are not really that special IMHO). Thanks in any case for the tip on the film version from Munich...I'm tempted to look it up. What I did not like about the Kupfer is how everytihing appears to be happening in the mind of Senta. It is as if she is imagining it all, she collapses at the end and the lights go off. I found it all anti-climatic. And then you have all these "sailors"?? dressed in white costumes with masks....huh? its all very confusing and I did not appreciate it at all nor could I connect with the ending. Try to watch the film version from munich, yes it was recorded in 1975 but the transfer to dvd is remarkably well done....and the ending is absolutely gripping! Candide? Asking for a friend . . . .